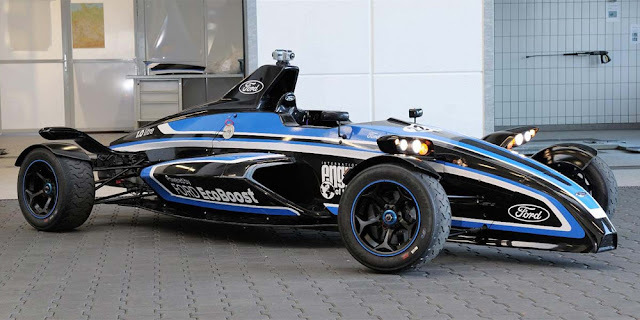 I don't know how a vacuum cleaner sounding, single seater open car car guaranteed to make anyone driving it look like a complete dork makes any sense but, it's always amusing to see what Brits get away with registering as "road legal". Amusing also, watching journalists trying to make the case these vehicles are a perfectly normal choice for a sunday drive down to the local pub. Right. However, as an engineering exercise by Ford, as a glimpse into the inevitable future of lightweight, fuel efficient high performance, the Formula Ford Ecoboost is extremely interesting. The reality is most of these cars are primarily track weapons and will get most of their mileage on the way to and from the track. However having the license plate on the back gives you the option of occasionally taking it out on the street when the next track day feels too far away. I argue any car anywhere can make anyone look daft or dorky. It's all perspective and what one is comfortable with. That said... I'd rock this every day of the week! !